Cutworms are moth caterpillars that have occasionally been seen over recent years on amenity turfgrass areas across the UK. 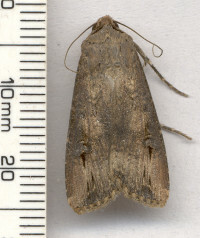 The one that is most frequently seen is the black cutworm that develops in to the Dark Sword-grass moth, Agrotis ipsilon. This moth is nocturnal, has a wingspan of approximately 40-50mm and has dark grey forewings with dark, dart-shaped markings towards their outer edge. 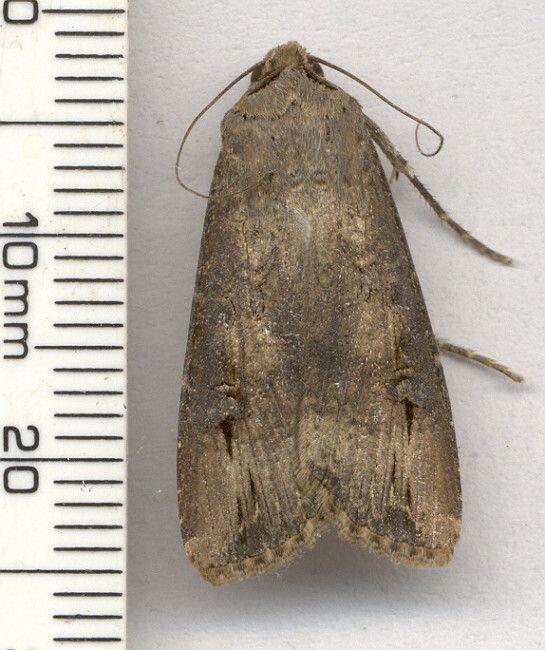 Although the adult moth poses no possible threat to the health of the sward, the black cutworm is becoming an increasing pest in the south but the extent of their presence across the country has not been formally recorded. The caterpillars are robust, dark green-grey with four black dots on each segment. They can reach 45mm or more in length and have a habit of turning around 'aggressively' if touched. They will feed voraciously on turfgrasses, affecting the sward by taking the leaf back to the crown. They can also feed on turfgrass roots and can cause a decline in the sward in heavily infested areas. In the UK, the moth is still regarded as a migrant species although the climate may now be mild enough in the south to allow it to remain here all year round. The female can lay upwards of a thousand eggs, in clusters of about 15, on the leaves of plants in damp areas. The caterpillars will emerge from the egg after approximately five days and begin feeding. They feed at night and have been seen living down aeration holes in golf greens, coming up to the surface to feed around the edge of the hole or, on occasion, grazing the turf across putting surface. The caterpillars can feed for up to two months, increasing in size through several moults before pupating in the rootzone for approximately 15 days. The adult moths emerge, mate and lay eggs in areas close to where they have emerged. The adult moth can be seen at any time between March and November but it is most frequently recorded in the UK between August and October. These moths can go through one or two generations per year. As a turfgrass pest, the black cutworm is generally considered an occasional nuisance in the UK however it is increasing being reported across the country and it would be interesting to know how far north this pest has been seen. If you have seen the black cutworm on your turf, please let us know. If it is genuinely an extensive and increasing problem, effective management options will need to be investigated.